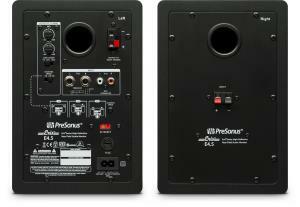 Presonus Eris 4.5 Powered Studio Monitors Overview By GAK. The Presonus Eris 4.5 active studio monitors are an excellent choice when you're serious about creating music. You need a monitor that will highlight any flaws in your mixes and tracks. Eris studio monitors are designed to deliver accurate mixes, tight bass and clear upper end. Cheap computer speakers and home-stereo speakers are designed to make music sound good and hide the flaws, while most low-cost studio monitors are hyped to sound good in the store showroom. If you mix on those speakers, you won't hear problems that can show up in your final production. As you expect from PreSonus, they use quality components, are well constructed, and deliver professional audio quality. They're lightweight and compact and look as professional as they sound. But what really sets them apart from comparably priced systems are pro features such as user controls that allow you to tailor the speakers' response to your needs. It's easy to customize Eris' sound for your room and type of music. Today's music producers deal with a wide variety of musical genres and often work in more than one location. That's why Eris-series studio monitors offer extensive user controls not usually found in their price class. Eris' Acoustic Tuning controls let you customize the speaker's sound with EQ. You get high-, mid-, and low-frequency bands. The High control is a high-frequency shelving filter that boosts or cuts all frequencies above 4.5 kHz by as much as Â±6 dB. Use this control to fine-tune the reproduction of high frequencies, depending on your room's acoustic characteristics. Keep in mind that settings above 0 will also emphasize any high-frequency noise in the signal. It's always better to cut than to boost, if possible, and it's best to use the least cut or boost needed to get the job done. The Mid control is a mid-frequency peak filter that boosts or cuts frequencies centered on 1 kHz and extending about one octave above and below that frequency. Again, setting this control to 0 will generally produce the best results. If you want to emulate a car stereo, try turning the Mid control below 0 to approximate the common "smiley face" EQ curve. To emulate a cheap portable radio, try turning it up above 0. Try not to boost much, since this can add noise to the signal. The Low Cutoff control rolls off the low frequencies below the specified frequency (selectable, 80 or 100 Hz) at a slope of -12 dB/octave. Engage this control if you are using a subwoofer in conjunction with Eris monitors, and set it to the same frequency as the crossover to the subwoofer. If you're not using a subwoofer, set the control to Flat. If you want to emulate a cheap radio, engage the Low Cutoff at 80 or 100 Hz while boosting the Mid control. Any loudspeaker is subject to an assortment of environmental and performance problems, and Eris monitors offer protection from most common of these. It would be wonderful if recording studios and equipment were immune from radio-frequency interference, electrical problems, heat, and so on. Since that's not the case, we've protected Eris monitors from the most common hazards. Finally, Eris' power amplifiers have a "soft startup" so that you don't get damaging pops in the speakers when you power them up. Eris monitors give you three different types of inputs so you can use them with a wide variety of audio sources. With three different types of audio inputs, it's easy to feed audio to your Eris monitors from a mixer, an interface, a media player, or almost any other line-level source. The Eris E5 and E8 provide balanced XLR, balanced ¼" TRS, and unbalanced RCA line-level inputs. When both balanced connections are in use, the TRS input will supersede the XLR input. The RCA input is summed into the signal path. The E4.5 has balanced ¼" TRS and unbalanced RCA inputs, as well as unbalanced 1/8" inputs for your smartphone or MP3 player, giving you all the flexibility you need when replacing computer speakers or those old studio monitors that have misled your ears for the last time. Take a moment, if you will, to consider the E4.5's balanced TRS inputs; balanced inputs help you minimize noise-a pro feature you won't find on competing speakers in this class.